Today I thought it would be fun to shake things up. 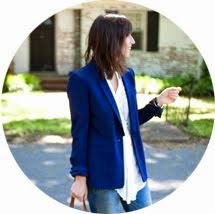 Last week I reached out to a few blogger pals to see if they wanted to join in a little collaboration. My idea was to have everyone style a Fall Go-To Look that followed just one rule. One of the products in the post must be under $60. 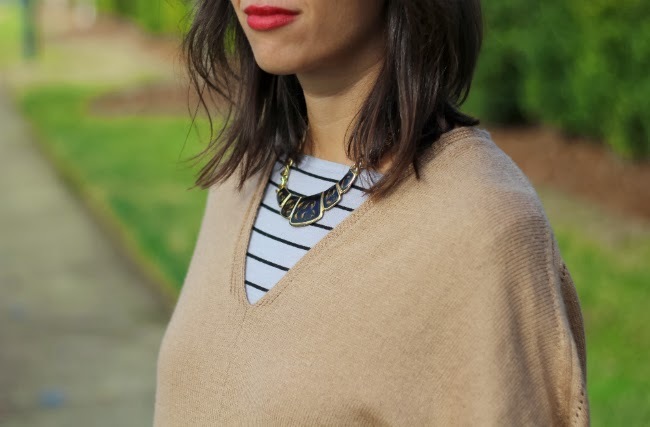 The goal here is to showcase a variety of looks that are budget-friendly (my sweater is $20!) and provide a fresh source of inspiration. Be sure to click on the blogger link-up at the bottom of the post to see all the #FallForLess looks! Many thanks to these amazing ladies for joining in the collab. Remember when I did this post on the Old Navy Frost Free puffer vest? Well, this sweater is Old Navy too and it's freakin $20. 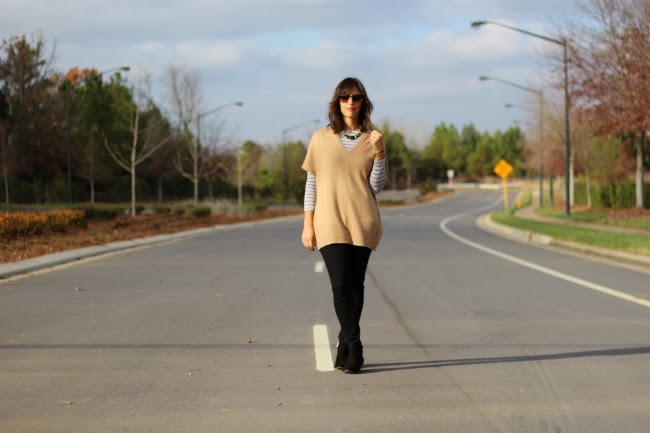 The V-neck Dolman sweater is perfect for layering and has that oversized slouchy look that is so easy-to-wear. I went up one size because I wanted it a bit longer to ensure I can wear it with leggings in the winter. The sweater comes in black, heather camel (pictured), light heather grey and blue. 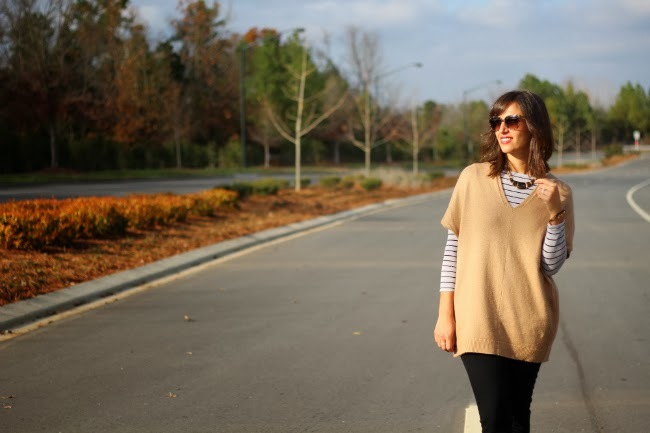 The heather grey and camel are my favorites and could work with absolutely anything in your closet. My Sole Society Becky ankle booties have been in constant rotation and have become my clutch Fall boot. 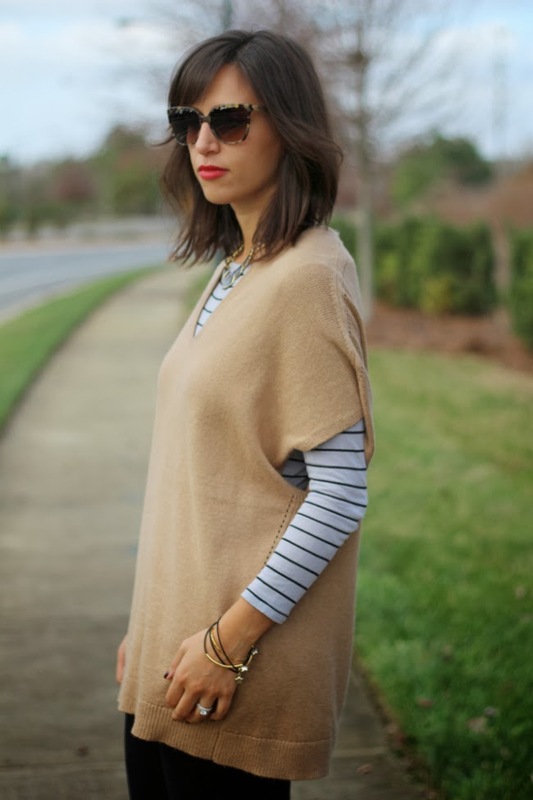 This striped long sleeve tee is the best layering tee on the planet. I bought it at a boutique in Philly and wish I would have snagged a few more. My black denim J. Crew Pixie pants are an oldie but such a goodie and I snagged the necklace years ago at a vintage store for $10 (similar style). 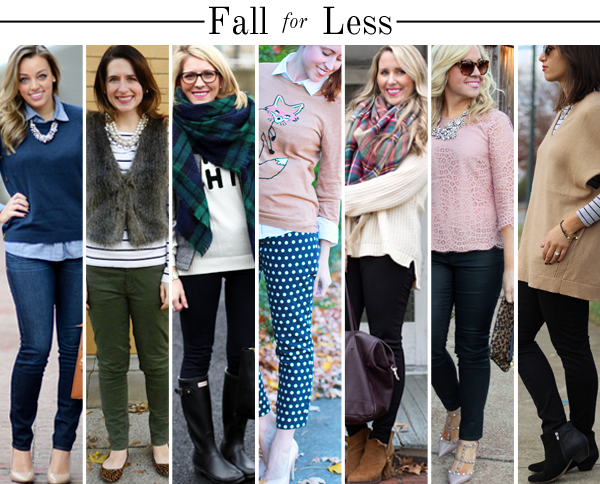 Shop the Post below + Be sure to peep all the amazing bloggers who styled a Fall Look For Less! Thank you so much for inviting me to be a part of this awesome collaboration! What a great idea for a post! All of you ladies are so chic. And LOVE those shoes! Hey there, loved your blog, just followed you on GFC (98), would you mind to follow back? What's the lip stick? Love the look, very comfy looking! LOVE THIS! Please make sure we do the next one together so I can plan accordingly!!! I love this look! That sweater looks like it is worth way more than $20.00! Such a great look on you! Love the layers! That sweater is so cute. I need to get to Old Navy! I loved this post! Thanks for sharing all the other links too! LOVE LOVE LOVE. you are adorable! & so happy we teamed up. we should def. doing it again here in the future! I need that poncho! Love this!! Love the sweater so much! Going to scoop up ASAP. 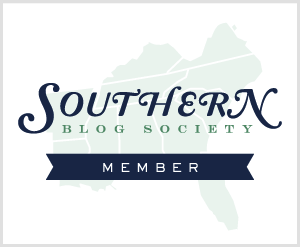 Thanks for coordinating the blogger collab! So fun!